Fan assisted Electric units (ELECTROFAN) which replace the LPHW finned element bank with electric elements to increase heat output. 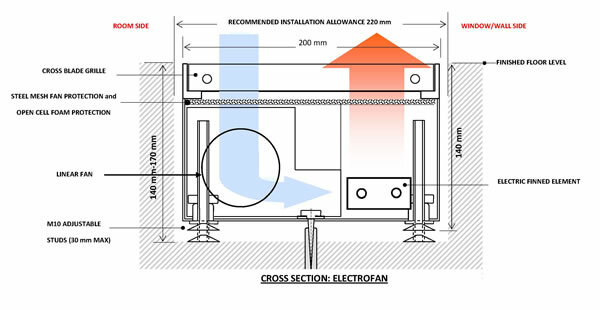 These forms of in floor heating solutions are particularly useful in combating downdraft and condensation in glazed areas such as conservatories, bi-fold doors and curtain walling. Due to the high level of heat output achievable they can also be used as a primary source of heat. The resultant maximisation of wall space also allows increased usable floor space. The varied choice of grille and angle finishes allows our units to fit in aesthetically with the vast range of finishes available in interior design. Our units are of high quality and provide a very efficient heating solution. See the right navigation for details of our ELECTROFAN range.